*Affiliate links, including those from Amazon.com, may be present in any of my posts. You can read my policy in more detail at the bottom of this post. Our family is thrilled to have been able to review a Berkey Water Filter over the last several weeks. Berkey water filters are definitely top of the line when it comes to filtering your water and can even filter pond water for you to drink should you need it! For our family of five (soon to be six) we decided on the Imperial Berkey which holds 4.5 gallons of water. It retails for $310.00. Our kids drink more water now because it is easily accessible for them versus our previous Brita water filter. We currently keep "the Berkey" as we affectionately call it on the counter, but I would love to get a stand for it so it could be off the counter. The Imperial Berkey is made of stainless steel and comes with two Black Berkey purification elements (expandable to six), 2 chambers, lid, a spigot, rubber gasket base, and 4 blocking plugs. The Berkeys have an upper and lower chamber that operate using gravity to filter the water that is placed in them. Gravity forces the water through the filters into the lowest chamber which holds only purified water. "This powerful system purifies both treated water and untreated raw water from such sources as remote lakes, streams, stagnant ponds and water supplies in foreign countries, where regulations may be substandard at best. Perfect for outdoor activities and a must in hostile environments where electricity, water pressure or treated water may not be available. This system removes pathogenic bacteria, cysts and parasites entirely and extracts harmful chemicals such as herbicides, pesticides, VOCs, organic solvents, radon 222 and trihalomethanes. It also reduces nitrates, nitrites and unhealthy minerals such as lead and mercury. This system is so powerful it can remove food coloring from water without removing the beneficial minerals your body needs. Virtually no other system can duplicate this performance." Pretty incredible wouldn't you agree?? Now you know why I am thrilled to have a Berkey in our home. So thankful!! My husband did a comparison between the Brita and the Berkey (as if you could really compare the two, but just so you know). 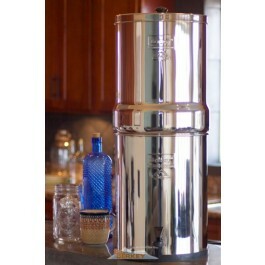 With your purchase of a Berkey you also receive Free UPS Ground Shipping to the lower 48 states. However, they are not able to ship to California or Iowa due to EPA standards. If you use my referral code you will receive 10% off your order.